From “What we Loved,” over at World Hum: I was passing through the Brussels airport this week when I saw a copy of Dave Eggers’ book What is the What? 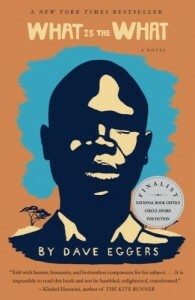 It’s the story of Valentino Achak Deng’s life in Sudan’s ci vil war and beyond. I’d been avoiding this book, partly because a friend told me it was boring. But on the recommendation of Doreen Baingana, who I met in Entebbe, I picked up a copy, started reading and haven’t stopped. I really didn’t want to like this book, because it seemed like one of those quasi-celebrity-vanity-charity projects that I hate. But I have to admit, I was wrong. It’s wonderful, transporting and brilliant.